To secure the best outcome in your bankruptcy situation, you must make strategic choices using the law to your advantage. At The Law Offices of Jonathan P. Shultz, LLC, we have helped countless Commerce City area families navigate their available range of bankruptcy options and form a legal strategy to better improve their financial future in the Commerce City area. When residents of the Commerce City area file for bankruptcy, they are looking for a fresh start on their finances. 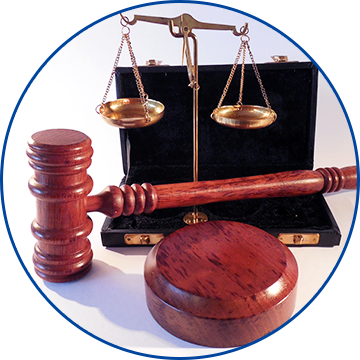 At The Law Offices of Jonathan P. Shultz, LLC, we help make the right decisions in your bankruptcy situation. For 8 years, we have helped clients from all walks of life better understand the bankruptcy process so as to more readily equip them in making decisions pertaining to every aspect of bankruptcy. At The Law Offices of Jonathan P. Shultz, LLC, we understand what it takes to really educate our clients about every side of a complicated bankruptcy case. We know how difficult it can be to face bankruptcy matters, so we strive to bring you both compassionate and thorough guidance through your case. 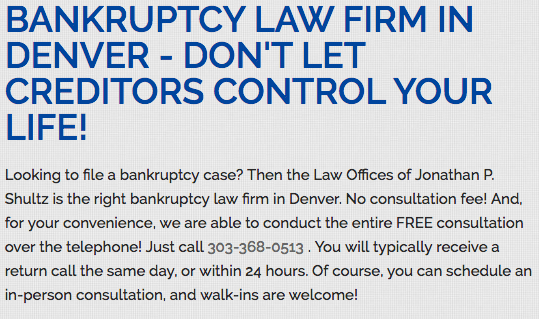 If you are from the Commerce City area looking for an experienced bankruptcy lawyer, do not hesitate to enlist our help. If you care about your financial future, call us at The Law Offices of Jonathan P. Shultz, LLC today. We have seen how bankruptcy and other bankruptcy matters have affected residents and businesses of the Commerce City area. Do not be intimidated, but instead call us at The Law Offices of Jonathan P. Shultz, LLC to see how your case can lead to freedom.